The solemn mission of this website is to Announce the "SECOND COMING" of YESHUA-MESSIAH; and exploiting the Vatican's ~Jesuit ~LED N.W.O. ; to remove the deceptive smokescreen and expose Satan's ~ PAPAL ~ "ANTICHRIST" ~ KINGDOM on Earth, ( DANIEL 11:45) NOT MESSIAH'S! (JOHN 14:1-3)… so that you may turn tragedy into triumph and rise to meet YESHUA-MESSIAH, the SAVIOUR in the air when He returns. THIS IS "NOT" THE JESUIT~CREATED RAPTURE ~"HOAX" OF THE UNBIBLICAL-UNFULFILLED 70TH WEEK OF DANIEL. CHRIST FULFILLED "ALL" WHEN HE DREW HIS LAST BREATH! LOOK UP THE MEANING OF RAPTURE. THIS WAS CREATED BY JESUIT RIBERRA IN 1590! THE BIBLE TEACHES WE ARE GEOCENTRIC! POPE FRANCIS FIRED JOHN BOEHNER SEPT 24TH. HE WAS IN "FACT": EXHORTING HIS RE-INSTATED SPIRITUAL / TEMPORAL JESUIT GLOBAL AUTHORITY! STANDING IN THE (CAPITOL BUILDING)= ROME'S BASCILLICA; FACING THE WASHINGTON MONUMENT (OBELISK, PILLAR, PHALLUS) JUST AS REAGAN WHEN HE OPENED THE DOORS FOR THE JESUITS! 1) To the falsified UNbiblical teachings by those who "claim to be in opposition to the Jesuit Order" with words they spew from one side of their mouth, while teaching Jesuit Spirituality ( LOYOLA'S SPIRITUAL EXERCISES). Rapture "HOAX" of Babylon "MYSTERY" Religion out of the other. This is Jesuit CAUSITRY / SOPHISTRY at it's finest! BLACK = WHITE! = THE END "JUSTIFIES" THE MEANS! 2) To "any" who deny this: ONE-TIME—SINGLE "EVENT" of the YESHUA-MESSIAH – THE CHRIST, Miraculous "Second Coming"! You see, The "Glorious Appearing", "Second Coming" AND the "First" Resurrection are all (one in the same) event! These are not different, sequential, or numerical but this single event precedes the "Millennium"! 3) "Anyone" who teaches "ANYTHING" other than these biblical truths set forth in scripture, are teaching pure Jesuitry . example: catching-away / rapture etc. 4) To have succession of "any" state, CONtinent, or nation ( REBUILD, RESTART, RECLAIM, OR RESTORE) = "DOMINION THEOLOGY"! = WORSHIP OF "SELF"! is to deny YESHUA'S price He paid; is to deny the fulfillment of the seventieth week of Daniel (opening the door for the Jesuit "created" rapture hoax)!, is to deny: His "Second Coming" / His Glorious Appearing, "OUR HOPE”, OUR "ONLY" HOPE; MANKIND'S "ONLY" HOPE! (to take His bride home to heaven); for His Kingdom is "NOT" of "THIS" world! ***If any in THIS world have "NOT" this "ONE" single, "PROMISED" Glorious HOPE…. that YESHUA paid with HIS OWN BLOOD (Our Redemption), then having been led falsely astray, they "are" lost, and they have "NO" hope! 5) To the deceptions posed by some, who CONtinually and intentionally leave out the most significant bottom-line reality and historical-factual truths and evidence to deceive the MASSes; DELIBERTLY HIDING THE MOST SIGNIFICANT PIECE OF HISTORY; THAT ROMERIKA / 1776 = JESUIT'S COUNTER ~ REFORMATION; OF THE JESUIT CARROLL'S FOUNDING OF AMERIKA AND THE "MARY" ~` LAND COLONY; AND JESUIT ~ GEORGETOWN UNIVERSITY THE "FIRST" JESUIT UNIVERSITY IN ROMERIKA AS THE STEPPING STONE AND BUILDING BLOCK FOR "EVERY" UNIVERSITY THEREAFTER. AND while pretending to be leading them in all truths; ACTUALLY LEADING THEM TO THE ETERNAL FLAME! (Roman Catholicism) = Lucifer "SUN" Worship (Babylon "Mystery" Religion / (666) / "Mystery Of Iniquity" Brother Paul refers to; "Organized RELIGION(S) = CHRIST -ianity"; that which is / has been / and will be practiced UNTIL our MESSIAH-YESHUA returns (Second Coming / "First" Resurrection). THIS IS "UNIVERSALISM"! = BABYLON CON -TINUM. Before I continue, a little history. I wish to make it known that I was born and raised in MARY-land who is named after and represents the Queen of Heaven (MARY)! 16 And he brought me into the inner court of the LORD's house, and, behold, at the door of the temple of the LORD, between the porch and the altar, were about five and twenty men, with their backs toward the temple of the LORD, and their faces toward the east; and they worshipped the "SUN" toward the EAST. = "SUN" ~ RISE SERVICES! ( EASTER / ISHTAR! History tells us that (AMERIGO) / ROMERIKA WAS NAMED AFTER Vespucci Amerigo an Italian Roman Catholic explorer. The Capital of Amerigo, (Washington D.C) is named after another Catholic Explorer Christopher Columbus; along with hero, Roman Sympathizer, Freemason, Deist, ("UNIVERSALIST" / GEORGE WASHINGTON. The White House is named after a "Jesuit" Catholic priest (Father Andrew White), WHO CAME UPON THE SHORES OF THE CHESAPEAKE BAY IN SOUTHERN "MARY" ~ LAND (ST. MARY'S CITY) / . Roman Catholic Daniel Carroll supplied the land for our Nation's Capital. Then after 26 years of Jesuit education in France (John Carroll returned to MARY-land and founded Georgetown University) in 1789 (13 years) after Adam Weishaupt's 1776 (JESUIT'S COUNTER REFORMATION) = ROMERIKA; the same year it became a nation. During this time, Charles Carroll was the wealthiest man in the colonies, also being the Commissioner of War and help finance the Revolutionary war. Interesting, how the catholic pieces fit so perfectly and yet it seems there are no Protest -ant pieces to AmeriKa's puzzle. As a young child, I was led one day to the Enoch-Pratt Library (I hated history by the way) and as I sat at the table I looked at all the gigantic portraits of the royalty upon the walls; not knowing why back then, but also amongst them were portraits of the aristocratic Carroll family, the Calvert's, AS WELL AS THE ROYALTY OF ENGLAND. Now,… I realize what I was being shown, the true significance of my childhood and why YESHUA led me there so many years ago; to plant a seed for TODAY: "A TIME SUCH AS THIS!" Now pause for a moment, if you will, and think about the most simple, but yet also, the most profound and indisputable documented HISTORICAL fact! Ancient history fully testifies to, as far back as you want to look for thousands of years, that when the huge masses of people came together, they formed into their own different world governing political civilizations. But what is most profound and documented is, that each and every one of these world civilizations, whether in the old world or new, "ALL" had in common the exact same and only "ONE" Religious "System" that influenced AND CONtrolled them. And that religious system was, Babylon "MYSTERY" Religion (Lucifer "SUN" Worship) / 666. For example: in the old world, Egypt, Assyria, Babylon, Persia, Greece and Rome; and in the new world, the Aztec, Mayans, Inca, Toltec and the Sioux, "ALL" (Worshiped the "SUN")! WHY IS IT NAMED THE "SOLAR" ~ "SYSTEM"! WHY SINCE YOU WERE BORN HAVE YOU BEEN TOLD THE EARTH ROTATES AROUND THE "SUN" AT 67,000 MPH! THIS IS HELIOS ~ CENTRIC! ( STATUE OF LIBERTY)! ROME'S GOD ( RAYS OF LIGHT EMINATING FROM THE "HEAD"! THE BIBLE TEACHES IN 77 PLACES; THE EARTH IS (FIXED) STATIONARY! THE SUN TRAVERSES ACROSS THE HEAVENS (UNDER THE BLUE DOME) / WATER… AROUND US ( RISES AND SETS EVERY DAY)SAME EXACT PLACE! THIS IS BIBLICAL GEOCENTRIC. Can you really grasp, fathom, or even really comprehend the almost incomprehensible magnitude and impact that this "ONE" World Religion has had upon "ALL" of humanity until this very day?? The reason why I stress and teach what I do and why you have never heard of or been taught this is because Babylon Mystery Religion is the "MOST" secretive, covered up, misunderstood, misrepresented man-made religion in "ALL" the world! It is also the largest, most powerful, influential, and the most wealthiest. AND THE "ANTICHRIST" POPE'S OF ROME IS ATOP THIS "SUN" ~ SYSTEM (PONTIFEX MAXIMUS) HIGH PRIEST OF SATANIC "SUN" WORSHIP! = BAAL WORSHIP / SELF! Because it masquerades itself as CHRIST–ianity, attaching CHRIST'S title to "ANYTHING" makes it sacred and HOLY Doesn't it?? (HOLY FATHER???) BUT in reality, it is Lucifer "SUN" Worship! That is why the Bible calls it "MYSTERY" Religion, because, it hides itself, works in secret, lies and deceives, to keep society from ever knowing what or who in reality they really worship. The center of Lucifer "SUN" Worship is the "UNIVERSAL" Roman Catholic Church; with it's Sovereign "High Priest" / PONTIFEX MAXIMUS of the "SUN" ( 'SOL–INVICTUS' ) BEING the Pope. HE rules the whole world, and every part of it is a lie to make a few people super wealthy and powerful in order to CONtrol the mass~es and to keep them in poverty and enslaved. The greatest theatrical production "IN THE WORLD"! All being orchestrated by Satan! DO WHAT THOU WILL, WHATEVER SEEMS GOOD IN "YOUR" EYES / "SELF"; SAME AS EVE RIGHT FROM THE BEGINNING! I AM god, YOU ARE god, WE ALL ARE god! WE ALL HAVE BEEN 'EMPOWERED'! (SOUND FAMILIAR)? The TRUE history of England isIN FACT; the "ONLY" nation that ever separated itself from the yoke and slavery of ROME AND HER System of Lucifer "SUN" Worship and the brutal savage warfare and struggle between the RCC, the Jesuits, and all of Catholic Europe uniting against the small island nation of England to bring her back into the fold of Rome. It all began during the years when King Henry VIII reigned, 1509-1547. It climaxed victorious for England, 150 years later, in 1688; when England finally threw off the yoke of Romanism and became the "ONLY" nation in the world "EVER" TO BE "PROTEST" – ANT. That year in English history is known as the "Glorious Revolution OF 1688". Let us read what the enemies greatest source (CATHOLIC ENCLOPEDIA) states: Below is the Royal Declaration that the King or Queen had to declare before taking the Throne. By doing this they declared that Roman Catholicism was a SUPERSTITIOUS and IDOLATROUS religion. The Royal Declaration is the definition of "PROTESTANT" ism. "I, A. B., by the grace of God King (Or Queen) of England, Scotland and Ireland, Defender of the Faith, do solemnly and sincerely in the presence of God, profess, testify, and declare, that I do believe that in the Sacrament of the Lord's Supper there is not any Transubstantiationof the elements of bread and wine into the Body and Blood of Christ at or after the consecration thereof by any person whatsoever: and that the invocation or adoration of the Virgin Mary or any other Saint, and the Sacrifice of the Mass, as they are now used in the Church of Rome, are superstitiousand idolatrous. And I do solemnly in the presence of God profess, testify, and declare that I do make this declaration, and every part thereof, in the plain and ordinary sense of the words read unto me, as they are commonly understood by English Protestants, without any evasion, equivocation, or mental reservation whatsoever, and without any dispensation already granted me by the Pope, or any other authority or person whatsoever, or without any hope of any such dispensation from any person or authority whatsoever, or without thinking that I am or can be acquitted before God or man, or absolved of this declaration or any part thereof, although the Pope, or any other person or persons, or power whatsoever, should dispense with or annul the same or declare that it was null and void from the beginning." Lopsided, slanted, and removed from history are the true, historical, biblical, prophetic, factual events and the many failed attempts of militarily forcing England back into the fold of Rome. Just to name a few: Smithfield fire" where 300 PROTEST – ants were burned alive, the many different attempts against Queen Elizabeth, The Spanish Armada, the Gunpowder Plot, and the 3 attempts made by the Jacobites. Rome couldn't reshackle England and was losing CONtrol, and THE JESUIT'S needed a place to launch their "COUNTER" Reformation in secret, behind the scenes for her futuristic Global "MISSION". Thus brings forth "MARY" – land in 1633: The "ARK and The DOVE" by J. Moss Ives, the 2 ships used to transport Jesuit Father White, Althan, and 1 other Jesuit priest. The 13 colonies with MARY-land as it's leadership role of the "Newfoundland". The REnamed District Of Columbia's Roman Catholic "UNITED-STATES" Of RomeriKa ( biblical 8th head); with it's original name being "Rome", with the river Tiber, named by Catholic owner Francis Pope, sheriff of "Charles" County. Her "mission" was to separate the colonies from England; and to make legal (Mass = "SUN ~ DISK = "SUN ~ WORSHIP) what was illegal (Mass) in England. during the founding years, Christ~MASS WAS OUTLAWED IN THE COLONIES; PUNISHABLE BY DEATH! (DO "YOU" HONOR THE BIRTH~DATE OF SOL~ INVICTUS? ( SATAN) LOOK IT UP IN ANY GOOD ENCYCLOPEDIA. Here is a brief biography of Jesuit Father White. This is a Catholic source click here. Born in London, White entered a Spanish seminary, studied in Douai, France, and was ordained a priest in 1605. He risked a cruel death during a period of renewed Catholic persecution(Remember: England and the colonies were Protestant) by becoming a missionary to Protestant England. In 1606, he was captured and banished from England following the Gunpowder Plot, and joined the Society of Jesus the next year. By the late 1620s or early 1630s, he was advising George and later Cecil Calvert about colonization of America, and on November 22, 1633, he accompanied the first colonists to Maryland as the superior of the Jesuit mission. He celebrated the first Catholic Mass in English America on March 25, 1634, and for the next decade labored to convert Indians and colonists alike. He wrote one of the most valuable and famous accounts of early Maryland and composed a grammar, dictionary, and catechism in the local Algonquian dialect. When Richard Ingle invaded Maryland in 1645, Father White, then 66, was transported back to England in chains (Remember superstitious and idolatrous Catholicism was illegal) and remained in Newgate prison until January 1648. (Jesuits were considered criminals) Although he pleaded to return to Maryland, he never did, and died in England in 1656. Which one of the original "13" Colonies was Catholic? 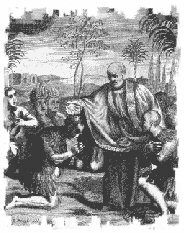 Picture above is Jesuit White selling the superstitious and idolatrous religion to the Indians. Notice Jesuit White was taken back to England in chains. Now lets fast forward to 2011. There are 28 Jesuit Universities and well over 200 colleges that are Catholic. Now 6 out of 9 Chief Justices on the U.S. Supreme court are Catholic. Remember Jesuit White was a missionary to Protestant England. Now the Jesuits came here has Missionaries to spread there superstitious and idolatrous religion in the Protestant colonies to infiltrate and in 1776 the Jesuits (UNDER WEISHAUPT) fomented the American Revolution using Freemasonry to make legal (Mass) = (SATANIC BLOOD RITUAL, SACRIFICE) what was illegal (Mass) in England. Now the Jesuits have been kicked out of over 80 countries. What is unique about America, is it is the only country founded by the Jesuits. We have people preaching to kick the Jesuits out of this country. People who keep advocating this are TEACHING JESUIT "FUTURISM" VIA DISPENSATIONALISM!. How do you kick some one out of a country they founded, financed and own?? You have false Jesuit history teachers telling us that the Jesuits took this country over in 1868 with the 14th Amendment. (This was just a building block not a take over) This is to keep us distracted and blinded to the real history, REASON AND PURPOSE OF 1776! It is a brilliant distraction!!! The Jesuits founded this government from its inception and in 1789 the year America officially became a Nation, Jesuit John Carroll founded the first Jesuit Georgetown University in 1789. By 1860 there were 11 Jesuit Universities. MANLY P. HALL DECLARES THIS VERY FACT AS WELL. Most colleges today are turning out graduates who have studied little or no history. In 1914, 90% of America's elite colleges required history; in 1939 and 1964 more than 50% did; by 1996 only one of the 50 best schools offered a required history course. The day is approaching, perhaps, when the only historians will be amateurs who study history as self-help, who examine the past in order to make sense of the present and not be caught unprepared by the future. Lopsided, slanted, and gone from history are the true factual events purposely hidden from history. When a nation has no true past history, the minds are molded by false history. False history makes the present fiction with out anyway to understand the future. GOD HAS SENT HIS SON (THE WORD) TO REMOVE ALL THE SUPERSTITIIOUS BABBLE. By distractions, ENTERTAINMENT, (sports, (MODERN-DAY GLADIATORS), TELL-A-VISION (WHO'S VISION ARE THEY TELLING "YOU"?, MOVIES, MUSIC (SATAN WAS THE PIPES OF GOD)!, HOLLYwood) , VIDEO GAMES, "EYE" ~ PODS, "EYE" ~ PADS, CELL PHONES… AND THERE IS NO COMMUNICATION TODAY!? THESE INTENTIONALLY CREATED DEVICES CREATE SERATONIN; (ADDICTION)! AND and just simply hiding parts of history molds the minds and culture, SETTING THE STAGE to be easily "PROGRAMMED" / controlled. This HAS allowed you to believe in a past that Never Existed! Which is Jesuit casuistry at work at its best. Casuistry is a system of rationalization to do legally what is forbidden morally. Rome in the past sent missionaries to a country. Using religion they would infiltrate the Government. In America, the Jesuits USED FREEMASONRY to infiltrate and foment the American Revolution (Against Protestant England) and founded this country using Freemasonic Icons (Jefferson, Washington, Paine, CARRIED FORTH TODAY BY DAVID BARTON,etc) to cover their tracks. You have Jesuit Historians telling us the Jesuits are responsible for every revolution in history, all except the American revolution??? Now 235 years later (ROMERIKANS) are believing in "A" past that NEVER EXISTED. Again Dear Reader this country was founded by Jesuits from its very inception . The American Capitol abounds with clues of its Roman origins. "Freedom," the Roman goddess ("MARY") whose statue crowns the dome, was created in Rome at the studio of American sculptor Thomas Crawford. We find a whole pantheon of Roman deities in the great fresco covering the dome's interior rotunda: Persephone, Cers, Freedom, Vulcan, Mercury, even a deified George Washington. These figures were the creation of Vatican artist Constantino Brumidi. Every State has a CONstitution and Maryland is called the Freedom State. The U.S. Government is a blue print of the "Mary"land CONstitution. Rome now has the freedom to practice her superstitious and idolatrous (Royal Declaration) RELIGION provided by the CONstitution, the Bill of Rights, and the Declaration Of Independence. these are all catholic doctrines allowing "sun" ~ worship (eating the wafer / cookie) What started with Jesuit missionaries (Mary-land) became the United States of America (Amerigo) government. The American revolution was about religion, not tea and taxes. This is VERY important, religion ALWAYS is used as the smokescreen to cover the true driving force of politic's. It was religion that fueled the issue to make legal (Mass) IN THE U.S.; what was illegal (Mass) in England. WHO REALLY GAINED FROM THE ROMERIKAN REVOLUTION? What did the England colonists in 1776 gain from the American revolution? SUBTILITY, AS IN THE GARDEN AGAIN; BEHIND THE SCENES CONtinually DESTYROYING GOD'S TRUTH'S, LAWS, DECLARATIONS BY PROFESSing CHRIST -ianity AS IT'S GREATEST COVER! From the American colonists' standpoint, to allow Catholics to vote or hold office was tantamount to surrendering the colonies to foreign conqueror. A crucial part of maintaining personal liberty in Protestant colonial America was keeping Roman Catholics out of government. But then came the Revolution. The colonial citizenry fought for and won their independence from Great Britain. They established a Constitution that amounted to…surrendering their country to a foreign conqueror. Consider the legalities. Before the Constitution was ratified, American Catholics had few civil rights; after ratification, they had them all. Now ask yourself: Which one of the original 13 Colonies was Catholic?? Now you know the rest of the story and understand the true motive for the American Revolution. Conclusion: What did England's Loyalists gain from the American Revolution? Satan is a master (Mason) deceiver. The Maryland-Mission was to set in motion the legal liberties necessary to allow Roman Catholics to practice "MASS", (transubstantiation, Baal-Worship, blood-sacrifice, where the cookie literally becomes Jesus Christ in the flesh; the wine His blood, thus putting Him to death anew and thereby committing canibaalism (Canaan's Baal) and becoming god! This occurs "every" time MASS is performed! So, now, practicing Babylon Mystery Religion / Lucifer SUN Worship / 666 was now legal (Mass) in ameriKa which was outlawed (Mass) in England. These "freedoms were assured by means of the CONstitution, The "Declaration Of Independence" made viable by the french-Masonic statue of (their) Liberty and all the other symbolisms in RomeriKa. that:CONgress was officially present 4 times at "MASS" during the Revolution, between the years 18 Sept. 1777 and 4 Sept. 1781, ALL being celebrated at St. Mary's in Philadelphia. The terms of the document are important, for even the extravagant and involved wording of the "long rigmarole" at the end added much to the sense of studied insult conveyed by the whole formula. Not only is the Mass stigmatized as idolatrous, but a false statement of Catholic doctrine is implied in the reference to the "adoration" of the Virgin Mary and the saints "as now used in the Church of Rome", while the existence of a supposed dispensing power is assumed which the CatholicChurch has never asserted. What added still more to the just resentment of Catholics at the continued retention of the Declaration was the consciousness that, in the words of Lingard, it owed its origin "to the perjuries of an imposter and the delusion of a nation". The formula was no one drafted by a Parliament in its sober senses. With the object of excluding Catholics from the throne, the Bill of Rights, after the deposition of James II in 1689, exacted of the monarch a profession of faith or "Test". The test selected was one which already stood in the statute book, and which was first placed there during the frenzy excited by the supposed Popish Plot of 1678. It was amid the panic created by the fabrications of Titus Oates, that this Test was drafted (not improbably by himself), and it was imposed upon all officials and public servants, thus effectually excluding Catholics from Parliament and positions of trust. 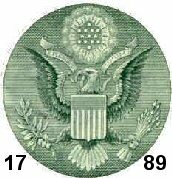 "Not only were many of the founders of the United States Government Masons, but they received aid from a secret and august body existing in Europe which helped them to “establish this country” for "(A PECULIAR AND PARTICULAR PURPOSE)" known only to the initiated "few"! This secret and august body that helped establish “this country” were none other than the Jesuit Order. AND “ALL” THESE NAMED PERSONS, PLACES AND EVENTS ARE IN FACT Biblically named "ONE" SINGLE GLOBAL DECLARATION: “SETTING THE POPE OF ROME IN GOD'S HOLY CITY, JERUSALEM”! BEWARE; THIS KEEPS EYES OFF THE PRESENT DAY "FIRST" ~ JESUIT POPE AND ALL THE PREVIOUS ONES THE REFORMERS ALL DIED FOR! Charles Carroll Carter is on the board of trustees of the Charles Carroll House of Annapolis, Maryland, the birthplace of Charles Carroll of Carrollton.He is a direct descendant of Daniel Carroll of Rock Creek, MARY-land..
George Washington, Thomas Jefferson, John Adams, James Madison, Patrick Henry, Benjamin Franklin. Nearly every schoolchild recognizes them as the Founding Fathers. But there were a great many more Founding Fathers, even if their names are not so familiar as the above. 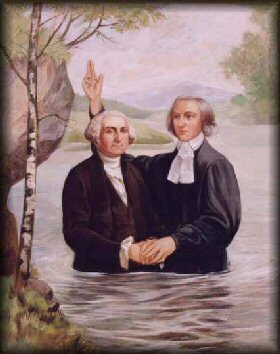 Several of those lesser-known men who played key roles in the creation of the United States of America were Catholics. George Washington, Thomas Jefferson, John Adams, James Madison, Patrick Henry, Benjamin Franklin. Nearly every schoolchild recognizes them as the Founding Fathers — signers of the Declaration of Independence, framers of the Constitution, heroes of the Revolutionary War. There were a great many more Founding Fathers, however, even if their names are not so familiar as the above. Several of those lesser-known men who played key roles in “the creation of the United States of America were Catholics”. Chief among them were three members of the Carroll family of Maryland: Charles Carroll, the only Catholic signer of the Declaration of Independence; his cousin Daniel Carroll; and Daniel Carroll's brother John Carroll, who became America's first Catholic bishop. Charles Carroll of Carrollton (1737-1832) was the most illustrious and best-known of the Carrolls. He was the only signer whose property — Carrollton — was mentioned in the Declaration of Independence. Carrollton was the 10,000-acre estate in Frederick County, Maryland, that Charles Carroll's father had given him on his return to America from his education in Europe. Daniel Carroll of Rock Creek (1730-1796) was a member of the Continental Congress (1781-1783), and a signer of the Articles of Confederation. He was a delegate to the Constitutional Convention and one of only two Catholic signers of the United States Constitution. (The other Catholic signer was Thomas Fitzsimons of Pennsylvania.) At the Constitutional Convention, Daniel Carroll played an essential role in formulating the limitation of the powers of the federal government. He was the author of the presumption — enshrined in the Constitution — that powers not specifically delegated to the federal government were reserved to the states or to the people. John Carroll was an intimate of Washington. He wrote a prayer at the time of Washington's inauguration asking God's blessing on the president, Congress, and government of the United States — a prayer still very much in use today. 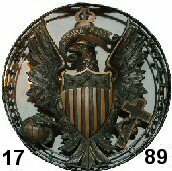 Out of gratitude for John Carroll's support during the war, Washington gave a modified version of the seal of the United States to the institution that is now Georgetown University, and that seal is still in use. Now, irregardless of "all" the Biblical, futuristic world events described in Revelation (all yet to begin the "DAY" they set up the (False-Messiah = "FINAL" ~ ANTICHRIST (Pope) in Jerusalem) / The "ABOMINATION" THAT "DESOLATES"! Click here (Matthew 24:15 , Daniel 11:45). The "SECOND COMING"of YESHUA-MESSIAH is imminent AND at hand! The "DAY" the "Final Antichrist is set up in Jerusalem it shall be (3 1/2 years) later that our MESSIAH comes to gather His "bride" to take them back to Heaven for the wedding feast The FATHER is giving His Son! (John 14:1-3). BUT AGAIN, LET US BE WATCHFUL NOW! OF THE PRESENT JESUIT POPE WHO HAS COME TO U. S. CONGRESS, U.N. (WORLD COURT). DOESN'T THAT SEEM STRANGE; OUT OF PLACE TO YOU? HAVE YOU GRASPED THE TRUE SIGNIFICANCE? Let not your heart be troubled: ye believe in God, believe also in me. In my Father's house are many mansions: if it were not so, I would have told you. I go to prepare a place for you. And if I go and prepare a place for you, I will come again, and receive you unto myself; that "where I am", there ye may be also. This is "not" "THE" Jesuit–created secret rapture, event, or catching away HOAX; for “every” eye shall behold His Majesty! Heaven shall be (totally) empty for the space of half an hour.This is a "ONE-TIME- ONE PHASE event! This is also known as the "FIRST RESURRECTION" OF WHICH HEBREWS Chapter 11 DEPICTS! THIS IS BY CHRIST'S FAITH, NOT OURS! READ GALATIANS CHAPTERS 1-6 AND EPHESIANS 1 + 2 = REAL "GOSPEL"! THIS being and "IS" MAN'S "ONLY" HOPE! Paul names The "BLESSED HOPE" as the "APPEARING OF OUR LORD"! The ones that come with Christ to gather His bride, (the wheat) are "angelic beings" not humans! The "First Resurrection" occurs at the same time as the "Second Coming" which begins the Millenium ( the 1000 year/ 7,ooo th year Sabbath); an allegory of the 7th "DAY" Sabbath. This is labeled the "Short Space" which is a literal 1260 days = 3 1/2 years = forty and two months = time, times, and the dividing of time = Daniels time of trouble (all an allegory of the 1260 years) of the "Dark Ages" of the "little horn power"(Rome/Inquisition). II Thes. 1:7-10, II Peter 3: 10-13, Rev 20, Rev 21:1-4, Jeremiah 2:12, Jeremiah 4: 25-26 YESHUA says He is going to cut it short, for the sake of the elect, for if He did not, NO FLESH would be spared. He is coming to "destroy those who are destroying the Earth"! He's not going to destroy Himself is He? They shall crown the POPE = "Pontifex Maximus" / HIGH PRIEST" AND SOVEREIGN PONTIFF OF THIS SYSTEM OF LUCIFEREAN SATANIC "SUN" WORSHIP SET UP IN JERUSALEM BECOMING THE COUNTERFEIT — "IMPOSTER" (FALSE – MESSIAH) END-DAYS FINAL-ANTICHRIST-SON OF PERDITION DICTATOR; DECEIVING THE WHOLE WORLD! VIA "UNIVERSALISM" = MARK! Let therefore all those who have been forbidden or not sent to preach, and yet dare publicly or privately to usurp the office of preaching without having received the authority of the apostolic see or the catholic bishop of the place", be bound with the bond of excommunication and, unless they repent very quickly, be punished by another suitable penalty. If the Roman Catholic Church and the Jesuit Order have made such strides and advances to bring England and RomeriKa under submission and UNDER THE JESUIT'S total CONtrol, let us ponder if you will, exactly what they are fomenting right now (behind the scenes) "AGAINST" the whole world! Why is the first jesuit pope here? May these words be of a great encouragement and hope to "ALL!" What we are looking straight in the face of is of such magnitude most cannot even comprehend what soon comes! 9/11 WILL BE FORGOTTEN! So much information that is being strewn across the "WEB" /"NET"! Most of which is JESUIT (C.I.A.) COUNTER ~ INTELLIGENCE; to CONfuse, distort, cloud, distract, lead astray, wasting your time and mind, TO KEEP YOU “ENTERTAINED” so you remain UNaware of what really has been / is taking place right before your eyes, AND behind the scenes. GMO, WATER, CHEMTRAILS, (GEORGIA GUIDESTONES). The scenario that is coming with such utter devastation! ( REV 8 + 16) May it make God's people long and yearn for "THE BLESSED HOPE"!, THE "SECOND COMING"! THE "FIRST" RESURRECTION! and "THE APPEARING" of Our MESSIAH-YESHUA! The “Greatest” single-“One-Time-Event” in man’s 6000 year reign on THE EARTH.